You need a delightfully clear weather app that can provide you with a 5 day weather forecast. It would be great if it is applicable to over 1,300 locations all across the world. This is really helpful as you can easily know if it will be rainy or shiny in your town on that day or other days with a single glance. Although having a Weather Forecast App installed may seem useless, but it really is not. They’re useful in many ways such as: helping you decide on your work clothes as you move out of your house in the morning, whether it’s a good day to go sailing or not or great day to go on a road trip etc. Thanks to this modern era of Technology, we don’t need to rely on a piece of stone hanging outside our wall to be able to predict the weather. Instead we can find out how the weather will be like in a jiffy, thanks to the Internet. It’s up to you how you choose to view Weather Forecasts, via TV or Smartphone Apps. There are many Weather Forecast Apps and tools that help you do this. In this age of Smartphones, people mainly rely on downloading Apps that benefit them on a regular basis for their own convenience, instead of having to google every day. There are many apps available on the Google Playstore, the question is which one should you choose. First obvious factor is, is the App genuine? You wouldn’t want to fall victim to wrong information as there have been many cases of accidents related to false Weather Forecasts. I’d like to introduce a Weather Forecast App called “ 5 Day Weather Forecast “ by Amdoren, available for free on the Google Playstore, (click here to download) for Android users. Typically such a weather app will require using an Internet connection. Hence you can make use of it without too much effort and what’s best of all, is that the App does not contain Ads! As the name suggests, this 5 Day Weather Forecast App shows the weather of the assigned location upto 5 days. As soon as you install the App, all you’ve to do is enter your Country and City’s name. Unfortunately for free users, you can only add upto 2 cities and the Forecast is updated every 12 hours. Where as if you’re a Premium user (One time $1.99 fee), you can assign 5 locations and the Weather Forecast is updated on a hourly basis. You should opt for the premium version as it can give you hourly updates and is extremely cheap. This is a highly important feature. You need such information all the time, in real time (Almost). This will also keep you well prepared in case you have to go to some particular place. In fact, updated information also lets you know whenever any bad weather is about to come your way. It always helps to be well prepared once you have access to information beforehand. Do note that even if you opt for a Free version of this weather app, you would still be getting updates of the weather forecast as these are made once every 12 hours as mentioned earlier. There are a number of options available with this app. 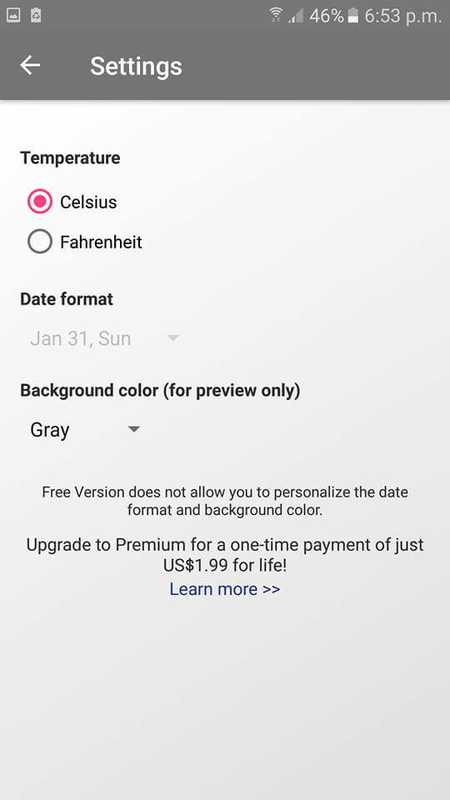 You can personalize the date format as well as the background color in the Premium version of this 5 day weather forecast app. There are a lot of other customization options too. Choose the ones that you need the most. Pick out the cities that you would like the information on. You may be planning a holiday with your friends and family. This is when you would need such a weather forecast app the most. After all, the last thing that you would want is, to spoil your holiday just because the weather played foul. Now you have an app that will not allow such a thing to happen. You need something that is easy to navigate. After all, you are looking for information here. 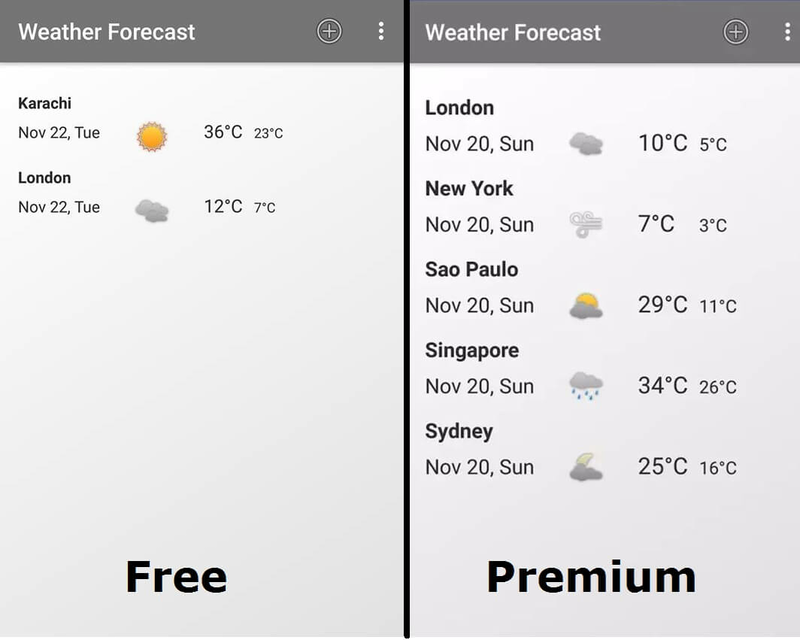 The last thing that you would want here is a series of ads cluttering your webpage and hiding away relevant information from you and in my opinion, this is what makes this App best and unique as compared to the other Weather Forecast Apps. Now you have this 5 day weather forecast app that provides a clear interface, easy navigation and no ads. Hence you can access the relevant information that you want very easily and securely. For more information, you can visit their official website by clicking here. Great article but most phones already have weather widgets so its kinda useless to download an external app for such purpose.